Tostadas are my go-to dinner after a long day at work when I get home late and am too lazy to cook. I always have various ingredients on hand to make them, and the great thing is that you can be creative based on what you’ve got. There’s no wrong combination. Lately, I find myself in a big rush to get home from work in time to get dinner on the table. Tostadas are one of my secret weapons because I can prepare some of the ingredients in advance so that come dinnertime, I can just throw everything together. I do all my grocery shopping on the weekend, which means I also need to take the time to prepare myself for the week and portion out lunches and dinners. I’ll often grill meat (or sometimes buy a rotisserie chicken), cut it up and store it in the refrigerator. This version pictured above is simply grilled rib eye seasoned with salt and pepper, shredded Chihuahua cheese and served with salsa verde. Another version I like to make has a base of refried beans smeared on the tostada, pulled roasted chicken (pollo rostizado), shredded lettuce and a little avocado topped with crema Mexicana and salsa. 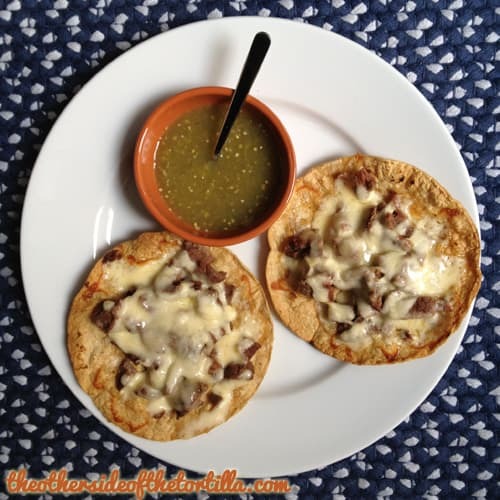 My cuñada likes tostadas with cueritos (see a tostada de cueritos pictured here) and manitas de puerco, neither of which are on my top 10 list of favorite kinds of tostadas, but that’s what’s so great about them; there’s something for everybody. You can’t say, “I don’t like tostadas” if you haven’t tried more than one kind. In Mexico City, I love to visit Tostadas Coyoacán in the mercado Coyoacán because everybody can get what they want and be happy. It’s inexpensive, quick and there’s a variety of choices. One person can get camarones (shrimp) and another can get pato (duck). Or they can get one of each! One of my personal favorites there is the tostada de cochinita pibil. Tell me in the comments: How do you assemble a tostada?